Following 999 minutes without a goal, Thomas Müller finally opened his account for the season at home to Wolfsburg. 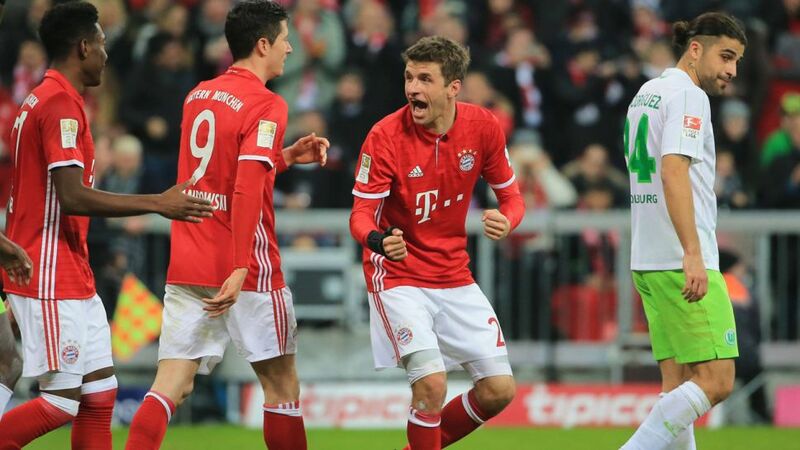 After exactly 999 minutes without a Bundesliga goal, FC Bayern München forward Thomas Müller finally ended his goalscoring drought in the record titleholders' 5-0 thrashing of VfL Wolfsburg. The victory saw Bayern move back to the top of the standings with the winter break fast approaching, but Müller's name was the one on everyone's lips following the game. "The whole team are delighted for him because it was important for his self confidence," said Robert Lewandowski, who himself scored twice in the encounter. "We've got two games left and I have no doubts that he'll score a few more." Want to draft Müller into your Official Fantasy Team? Sign him up here! Ending his run of 12 top-flight outings without a goal proved costly in the end for Müller, who before the game put his money on the line against club chairman Karl-Heinz Rummenigge. "I made a bet with him yesterday that he'd score," Rummenigge told the assembled press. "Perhaps I just had to tease him a little to motivate him." He may be out of pocket, but his response to Bayern's US social media channel told the whole story: It's not magic, it's Müller! Talking to the assembled press in the catacombs of the Allianz Arena, the German international opened up about finally finding the back of the net, his bet with Rummenigge and the favour FC Ingolstadt 04 did Bayern on Matchday 14. Question: Thomas Müller, congratulations on ending your goalless run, which ended after 999 minutes. Were you keen to avoid hitting quadruple digits? Thomas Müller: It was a nice moment for me. I really enjoyed the first half. It was intense and we had phases of play where we performed really well. I was hunting for a goal, but the fact I hadn’t scored wasn't driving me crazy. It just meant that in every passing match I had to find new ways to try and get on the score sheet. Question: Have the questions raised by your lack of goalscoring bothered you at all? Müller: It only gets frustrating if I'm not satisfied with my own performance or the opportunities I squandered that might have led to a goal. But if I've had a good game and have given everything I could then I'm more than capable of handling the questions that are asked of me. It's important to be in a good state of mind, to demonstrate that and be there to help the team. If I have to endure a 999-minute goal drought then so be it! However, I do hope I don’t have to wait that long until my next goal. My goal was, by no stretch of the imagination, an outstanding individual effort. Question: Can you credit a change in formation for your first goal of the season? Müller: There's a lot of scope for interpretation. Even before the system changed I was getting in the exact same positions and failing to score. You also need a bit of luck at times. The goal against Wolfsburg wasn't the most beautiful I've scored, but I was happy the ball actually fell kindly for me. That's how it is in football. If you push forward and pressure the defence then every so often an opportunity falls to you - it’s nothing unusual. My goal was, by no stretch of the imagination, an outstanding individual effort. Question: There was a bet between yourself and club chairman Karl-Heinz Rummenigge before the game. How much are you out of pocket? Müller: I have settled the bet and can sleep well tonight. It was unusual because I ended up betting against myself, but I had no choice as there wouldn't have been no bet otherwise. Question: What are your thoughts on Ingolstadt's victory over RB Leipzig? Müller: To Ingolstadt I say "thank you". Of course, their result has helped us. We can control our destiny in our own games but it's always a good thing, when your direct rivals, especially those above you in the standings, lose to someone else.